The DS-11 Series of Spectrophotometer/Fluorometers from DeNovix and the NanoDrop™ One are both used to perform fast quantification of nucleic acids and proteins. The spectrophotometer/fluorometer range from DeNovix provides superior limits of detection, the widest dynamic range, an easy-to-use interface and powerful networking features, which surpass the capabilities of the NanoDrop™ One. Here we will provide a comparison of the features of the DeNovix DS-11 FX Spectrophotometer/Fluorometers and the NanoDrop™ One. One of the founders, and core team members involved with NanoDrop Technologies Inc. is also a founding member of DeNovix. 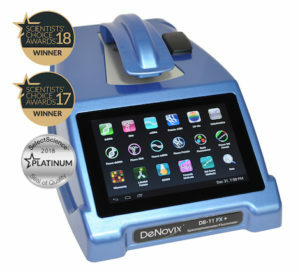 The DS-11 was first introduced to the market in 2013, and it was the first UV-Vis spectrophotometer in the world to be Android controlled, touchscreen and be network-connected. Over the years, DeNovix has expanded the instrument’s features and functionality by collaborating with the Life Science community. The DS-11 Series was created in 2015, when a fluorometer with high sensitivity was integrated into the system. The DS-11 FX+ is patented (US9442009) and offers outstanding limits of detection for fluorescence quantification (0.5 pg/μL dsDNA) and microvolume absorbance (0.75 – 37,500 ng/μL dsDNA). In just one unit, labs can choose the integrated model that fits both current and future research needs with the combination of fluorescence detection, microvolume UV-Vis and cuvette UV-Vis. All DS-11 Series instruments come with an industry-leading three-year factory warranty from DeNovix. See the full comparison of the DS-11 Series Spectrophotometer/Fluorometers vs the NanoDrop™ One read the full technical note here. NanoDrop ™ and NanoDrop ™ One are registered trademarks of Thermo Fisher Scientific and its subsidiaries.